For more information, see: Indochinese revolution. Dien Bien Phu (Điện Biên Phủ, pronounced Dee-yen Bee-enn Foo) is a valley and small town in North Vietnam, 260 miles northwest of Hanoi and the place of the decisive 1954 battle that forced France to relinquish control of colonial Indochina. Dien Bien Phu City is today the capital of the Lai Chau Province of Vietnam and is developing a tourism economy based on the battlefield. There is now a commercial airfield for commuter jets. The province has borders with China and Laos. In military parlance, "Dien Bien Phu" has also become a synonym for an extremely unwise decision: the attempt to hold a seemingly strong defensive position, against which the enemy, cooperating with the defender's plans, will then destroy himself against the impregnable fortifications. The French had two objectives in seizing Dien Bien Phu: protecting access to Laos and luring the North Vietnamese Army to attack the fortified Dien Bien Phu defenses. The first objective required mobile forces to operate from the base. For this reason, the French high command selected Brigadier General Christian de Castries, a specialist in armored operations, as the operational commander. It was expected he could use the tanks flown into Dien Bien Phu. The opportunity never developed, as the tanks quickly failed. The second objective would have repeated French success at the Battle of Na San, which may have encouraged the French to believe the enemy would again smash themselves against a fixed position taken by airborne troops. While these objectives seemed reasonable, serious analysis should have shown the French commanders that Dien Bien Phu was far more isolated and far more dependent on air mobility than Na San. Additionally, the Viet Minh commander Vo Nguyen Giap did not play the part the French commander, Henri Navarre, had written for him. The Dien Bien Phu operations were a part of a broader French Indochinese colonial policy aimed at containing the spread of North Vietnamese communism and the ideas of national liberation. Dien Bien Phu was on the main road between North Vietnam and Laos; control of this town was vital to controlling the lines of supply and communication between North Vietnam and Laos, not just Tonkin and the Red River Delta. The latter had been the focus of previous operations in the region, and it was a new French priority to block movement into Laos. Even with the much greater historical material available today, there are still inconsistencies in timelines and other information about the battle. The French command structure, which was to some degree split, is confusing both in its very makeup, the authorities at any given point, and the taking of actions while apparently simultaneously in possession of intelligence suggesting an action would be unwise. Unity of command, or having a single final decision-maker, is a repeated problem during the U.S. involvement in Vietnam, unity of command problems were evident at the 1963 Battle of Ap Bac, with disagreements internal to South Vietnamese commanders, internal to US advisory command, and Vietnamese-American relationships. There were unity of command problems in the 1972 Operation LINEBACKER II all-American bombing of the North. The timing of the first Communist response, especially deliberate ones rather than immediate response to the landings of the paratroopers, is not clear. In particular, various accounts of the dynamics among Giap's headquarters, the Lao Dong Party (i.e., Indonesian/Vietnamese Communist leadership), and the Chinese Military Assistance Group (CMAG) as well as Chinese Politburo have inconsistencies. Some reports have the Chinese advisers demanding an immediate attack on the paratroopers still forming, some suggest it never happened, and others say Giap started but then stopped it to move to a more deliberate approach. There are also reports that some Chinese decisions reflected, very quickly, the results of secret US-French meetings in Washington, with a distinct lack of clarity about how the Chinese learned about things held tightly in Western governments. Even though there are joint Vietnamese-Western historical meetings, some of the truth may never be known, since most of the key officials have died. Giap, while retired, is one of the few living principals, who wrote about it at the time, but has recently discussed it, much more frankly, with American retired officers. In 1952, Giap had recognized the French were weak in Laos, and sent three divisions and an independent regiment southwest from his mountain bases. They pushed the French back, clearing road junctions and capturing small towns including Muong Thanh (Dien Bien Phu). 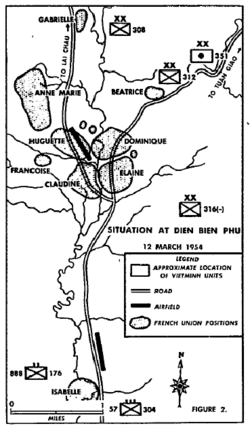 Dien Bien Phu was part of a larger Viet Minh strategy to force the French to commit their mobile forces to static defense and lose the operational initiative. In parallel with it, the Viet Minh marched divisions into the northwest, attacking local "bandits" and attacking the French column retreating from Lai Chau. As the French concentrated at Dien Bien Phu and in the Red River Delta (Hanoi-Haiphong area), they began to lose initiative and mobility. The Viet Minh began another offensive toward middle Laos, targeting the airfield at Seno. In order to defend Seno, the French were forced to commit yet more mobile forces to static defense. The Viet Minh plan was to leave only a small reserve to protect the rear, while attacking the Western highlands. Kontum was taken and the French had to form yet another static defense at Pleiku. Viet Minh troops repeated this tactic in Upper Laos by threatening Luang Prabang which again forced the French into a static defense. Navarre, an armor officer, thought the flat valley of Dien Bien Phu would be ideal as a base for mobile operations and flew in 32 tanks. However, with the rains, the tanks were soon defeated by mud; only 2 were usable when the final attack came. After this misfortune, Navarre came to believe that the greatest strength of the garrison was artillery, commanded by Colonel Charles Piroth. Jean-Louis Nicot, the French air force transport chief, advised against putting the force into Dien Bien Phu, doubting his ability to keep it supplied. On November 23, 1953, the French dropped a paratroop force into Dien Bien Phu, using 65 transport aircraft supported by fighters and bombers. Once landed, the paratroopers set about improving the airfield so that heavier equipment could be landed. There was confusion, however, on just what equipment and troops would eventually be needed. Approximately two weeks before the jumps into Dien Bien Phu, French intelligence learned that regular Communist units were in the area, equipped with artillery that paratroop units could not match. This intelligence meant that heavier units would be needed, even to the later replacement of the Airborne commander with an armor officer. The French correctly gauged the Viet Minh infantry strength they faced, but were unrealistic in their ability to deal with it, and totally underestimated the enemy artillery and anti-aircraft artillery resources. This complement of paratroops were ready by the 22nd. His preparations complete, Gilles went back to overall command of French airborne forces in Indochina. He was was replaced by Col. Bastiani's airborne group headquarters. That group, in turn, was reinforced with heavier forces, including tanks that were flown in and reassembled at the base. On December 12, overall command of the Dien Bien Phu area was given to Col. Christian de Castries, an armor officer, and his deputy, Lt. Col. Pierre Langlais. Once the airstrip was improved, the French began flying in heavier equipment. Eight 105mm howitzers of the Autonomous Laotian Artillery Battery landed on November 28. Better artillery followed. On November 30, paratroop units under Capt. Pierre Tourret began to maneuver out of the base, with the intention of linking up with French-led guerrillas. Outside the Dien Bien Phu area, Groupement de Commandos Mixtes Aeroportes (GCMA) guerrillas under Roger Trinquier moved toward the position. GCMA had some similarities to the later MACV-SOG, as a principally covert operations force. On December 5th, Tourret's force ran into heavy Viet Minh opposition, and were able to return only with artillery support from the base. They did not successfully link up with the GCMA force. 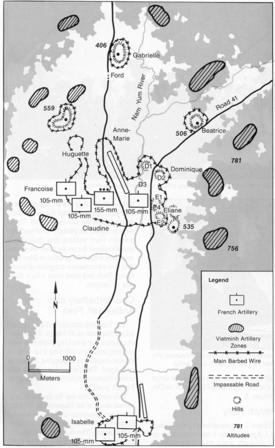 Between December and the main Communist attacks of March, the French built a position at the bottom of a valley consisting of a set of strong-points with three main artillery firebases. As opposed to Vietnamese practice, the French guns were in the open and not camouflaged. Col. Piroth, the artillery commander, continued to increase his resources, but with what often turned out to be inferior weapons. Mon General, no Viet Minh cannon will be able to fire three rounds without being destroyed by my artillery. The Viet Minh had nothing heavier, nor longer-ranged, than 75mm. The Viet Minh always placed their guns on the reverse (i.e., back) side of hills, a traditional tactic for protecting the guns against observation and direct fire, or counter-battery fire. Thus, Pirot's conclusion was, the 75mm artillery firing from the reverse slope could not hit the French positions, but the larger French guns could hit the Viet Minh guns. Following the lessons of the Battle of Vinh Yen, Giap had avoided direct confrontation with the French strength. But after the success of his strategy of provoking the French into static defensive positions, Giap felt that he now had a stronger position against the French. It was quite proper military thinking for him to ask if he could be certain of victory in attacking Dien Bien Phu. No matter how important it might be to the Navarre Plan, no matter how much it might be a center of gravity, he knew he should attack it if and only if he was confident of victory. A fundamental principle of revolutionary war, according to Giap, was "strike to win, strike only when success is certain; if it is not, don't strike." Giap's immediate question was whether to "strike swiftly and win swiftly, or strike surely and attack surely." The first option would have meant attacking the paratroopers before they had consolidated. But the Viet Minh "troops lacked experience in attacking fortified entrenched camps", and from the beginning the French forces fortified their positions. In spite of this, Giap ordered an attack in January. Arguing against a quick strike was that the French in the Dien Bien Phu area were in an isolated mountainous area. They were cut off from their overland lines of supply and could be re-supplied only by air. The Viet Minh could keep the initiative by concentrating their troops. Viet Minh supply was well managed. Giap's chief of staff, who managed the logistics, was Van Tien Dung, who would later command the final invasion of South Vietnam. Contrary to Giap's fears about attacking French entrenchments, he did launch a first "human wave" assault in January 1954, partially at the recommendation of a Chinese adviser, Gen. Wei Guoqing. Wei had been the original head of the Chinese Military Assistance Group, assigned to it in April 1950. Senior General Chen Geng joined CMAG in July 1950 and throughout the war he insisted that his advice was followed, including at Dien Bien Phu. He would call Ho Chi Minh or Mao Zedong with his recommendations and threatened Giap with his resignation if Giap did not accept his advice. These attacks failed because Viet Minh artillery was not then in position and the French reinforced faster than the Chinese advisers had expected. The Chinese central command ordered Wei to abandon the direct attack and "strive to eliminate one battalion at a time." China sent antiaircraft and engineering experts to help isolate Dien Bien Phu. Giap then changed the plan. Historian Stanley Karnow quoted Bui Tin as saying "[Giap] changed the entire plan. He stopped the attack and pulled back our artillery. Now the shovel became our most important weapon." After Giap had drawn the French strength toward Dien Bien Phu, he used human labor to bring howitzers and anti-aircraft artillery into the hills surrounding the French base. He used his laborers to dig the weapons into reinforced emplacements on the forward slopes. A Viet Minh cannon could fire and be quickly pulled back into the safety of a cave. Giap had orders from the North Vietnamese Politburo to launch human-wave attacks on January 26, which he concluded would play into the French strength. Instead, possibly endangering his life, he called off the attacks and continued fortification until March 13. Giap knew, however, that his own strength was in well-protected howitzers and anti-aircraft artillery. By the time his main attack started, the Communists had three times as many artillery pieces than the French: at least 36 105-mm howitzers, as well as 48 75-mm pack howitzers and 104 other field guns of 57-mm caliber or greater. He also had additional fire support in reserve and waiting for the final assault. Other nations, as well as other French forces, were monitoring the situation. US transport pilots, such as the legendary Earthquake McGoon, were flying missions to Dien Bien Phu to drop supplies, using C-119 Flying Boxcar aircraft. They worked for a Central Intelligence Agency proprietary airline called Civil Air Transport. While Civil Air Transport personnel, a number of whom were shot down, clearly would drop military supplies, it is not clear if they were prepared for the greater structure of a paratroop operation. It was clear by March, that salvaging the French position would require external foreign relief, especially from the US. To secure US support for the French war in Vietnam, General Paul Ely, Chief of Staff of the France Army, visited Washington starting on March 20 to discuss various options for US support. Operation VULTURE called for massive US bombing of the Dien Bien Phu perimeter. Radford was the strongest proponent of greater US involvement, including this plan, which he initially suggested to Ely was a distinct possibility. Eisenhower rebuked Radford on April 5 for misleading Ely about the chance of US support. He told Radford, who was not then supported by any of the other chiefs, that the proposal was politically impossible. Even the hard-line anti-communist Secretary of State, John Foster Dulles, agreed it would be possible only with British agreement which was not likely. Navarre considered a high-risk breakout of the garrison which he code-named Albatross. This plan envisioned a breakout toward Laos, which he mentioned to Ely in an April 30 message. During this time, Navarre's intelligence obtained a high-level clandestine human-source intelligence source in Ho Chi Minh's government which gave the French some perspective. Operation Albatross would involve dropping additional paratroopers outside the Dien Bien Phu base in order to initiate the breakout. A major obstacle to this plan was that by this time French airlift capacity was severely strained, and Navarre might not have had the requisite aircraft for the drop. A variation on this plan called Operation Woodpecker (Pivert), earlier known as Operation Condor, would drop paratroops only after a breakout had started. With insufficient airlift, only a part of Condor was attempted. Col. Nicot said that the French air transport was insufficient to support such an operation creating additional pressure for US involvement. Either way, there was as much a need for American logistics as there had been for firepower in Operation Vulture. The Viet Minh main assault started on March 13. Giap described the first phase as attacking the northern sector from his "newly built network of attack and encirclement positions." French strongpoints "Beatrice" and "Gabrielle" were soon incapacitated. I am completely dishonored. I have guaranteed de Castries that the enemy artillery couldn't touch us—but now we are going to lose the battle. I'm leaving. Probably on the night of the 15th, but possibly as late as the 19th, Piroth committed suicide. De Castries's chief of staff, Lt. Col. Keller, was in a severe clinical depression and totally ineffective. Lt. Col. Jules Gaucher, an excellent officer commanding a Foreign Legion unit at the Beatrice strongpoint, had been killed by shellfire. De Castries was rapidly losing his key senior subordinates. The last French aircraft that successfully flew out of Dien Bien Phu lifted off the runway on March 27. After that, only those supplies that could be dropped by parachute could be delivered. Parachute bundles often missed the French garrison and the Communists especially appreciated some of the food. By March 28, the effective French perimeter had contracted and the second phase of the main battle, called "strangulation," began. Even with the declining situation, de Castries wanted to suppress one area of Communist air defense, west of Claudine, and Bigeard led a successful counterattack, with air and artillery support. According to Giap's strategy, the next phase ran from March 30 into mid-April. The principal aim here was to gain the French positions, thus strongpoints exchanged hands several times. His basic goal was to dominate the communications trenches and the airstrip with fire; "our tactics were to encroach, harass, and wrest every inch of ground from the enemy, destroy his airstrips, and narrow down his air space." This phase of the battle became what was called the Battle of the Five Hills: Dominique 1 and 2 and Eliane 1, 2 and 4. Langlais decided that Bigeard's counterattack had proven French effectiveness in the lowlands, and expected the next attack would be on the hills east of the Nam Yum. There was still a belief that French artillery could keep the enemy off outlying high ground. Nonetheless by the end of April, Giap was prepared to launch his final assault. 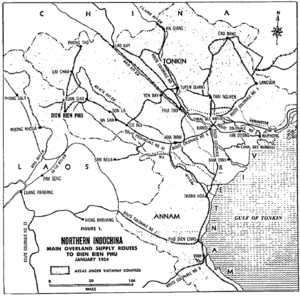 Giap described the goal of the final phase, from May 1 to 7, as attacking the remaining pocket from all directions and taking the enemy headquarters. In this phase, he made use of Soviet multiple rocket launchers. French commanders outside of Dien Bien Phu, even when it was clearly to fall, made various recommendations for limited breakouts. In other cases, they were very insistent that while the French forces might stop fighting, they must not raise the symbolic white flag. In turn, French troops generally rejected breakouts because they were reluctant to abandon their wounded. As one French trooper put it, referring to a legendary French Foreign Legion fight to the death, you can do Camerone with a small force, but not with 10,000. Following the surrender of the Dien Bien Phu pocket on May 7, the Viet Minh did not have the medical or military police resources to deal with the number of wounded and prisoners: approximately 7,000 prisoners, of whom 1000 were seriously wounded. Prisoners were treated harshly. Part of the reason for the harsh treatment may have been Vietnamese recognition of the bargaining value of prisoners of war, much as the North Vietnamese did with US aircrews in 1964-1972. Viet Minh treatment was harsh in general; no seriously wounded prisoners survived. Still, there seems to have been especially bad treatment, which Fall describes as a "Death March", for the Dien Bien Phu survivors, followed by extensive political indoctrination and other hardships in prison camps. Prisoner exchange began on August 18, 1954, after the signing of the treaty on July 20. When North Vietnamese and American troops faced one another at another remote valley called Khe Sanh, both sides had Dien Bien Phu in mind. Even the press of both sides made similar comparisons in spite of many differences. Where Dien Bien Phu was essentially on its own, immense U.S. tactical air power was used as part of the defense, and, while it was supplied by air, the airfield was never closed. Further, while Dien Bien Phu was seen as the center of gravity for the French in 1954, the North Vietnamese, in 1968, saw the cities, and the general uprising they hoped to trigger, as the center of gravity. Giap invited Moore and Galloway to visit the battlefield, saying he did not understand why the US had not studied the war of the Viet Minh against the French, and Dien Bien Phu specifically. If the Americans, according to Giap, had studied what happened to the French, they would never have come halfway across the world to take their place and suffer as bad an ending. He pressed the point that the Americans were paying for the operation, which Fall denies, saying US expenditures, between 1946 and 1954, were $954 million where comparable French costs were $11 billion. This page was last modified 01:12, 18 September 2010.